The nearest National Rail station is Sunderland. The nearest Metro Station is South Hylton. 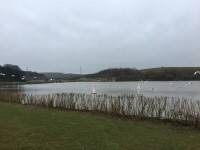 You are on Parking (Model Boating Lake). Skip to the next section. 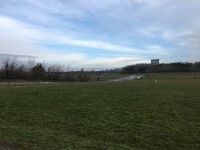 The car park is located to the north side of the park, opposite the model boating lake. 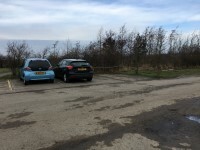 There is/are 5 Blue Badge parking bay(s) within the car park. 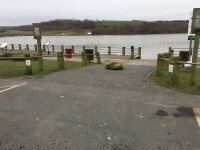 The dimensions of the Blue Badge parking bay(s) are 368cm x 488cm (12ft 1in x 16ft). 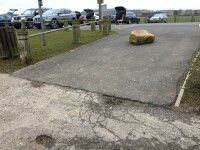 The nearest Blue Badge bay is 3m (3yd 10in) from the model boating lake car park entrance. 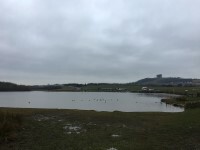 The furthest Blue Badge bay is 16m (17yd 1ft) from the model boating lake car park entrance. Please see the Herrington Country Park Car Park and Toilet Block guide for the main car parking details. 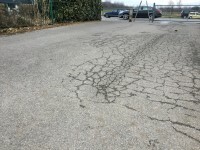 You are on Parking (Skate Park Car Park). Skip to the next section. 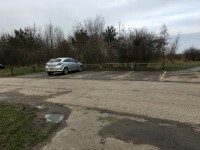 The car park is located to the west side of the park, opposite the skate park and BMX track. 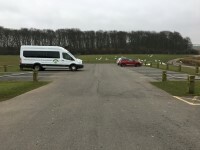 You are on Main Country Park Vehicle and Pedestrian Entrance / Exit. Skip to the next section. 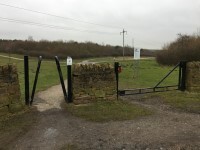 The main entrance / exit to the country park for vehicles and pedestrians is located off Chester Road. There entrance road has two lanes. 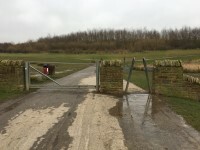 The road has gates which are closed at dusk. 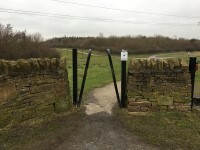 There is a footpath to both sides of the gates and road. 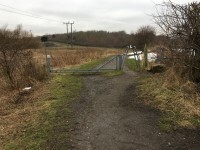 There are no gates on the footpath. 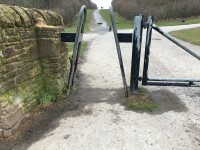 The clear width on the footpath to the left of the gates is 176cm. 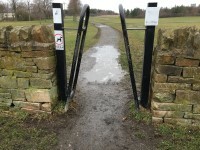 The clear width on the footpath to the right of the gates is 89cm. 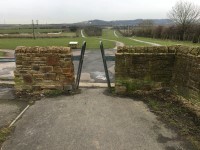 You are on Outside Access (Main Car Park Entrance). Skip to the next section. 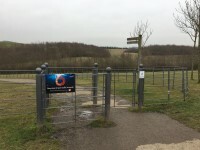 This information is for the entrance located leading to the park from the main car park. 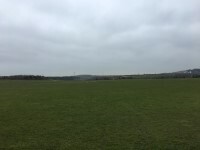 The width at the lower part of the entrance is 112cm. 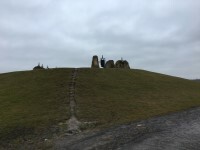 The width at the upper part of the entrance is 32cm. 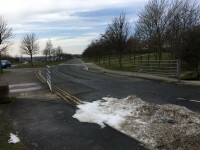 You are on Level Change (Main Car Park Entrance). Skip to the next section. 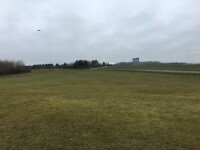 The ramp or slope is located immediately beyond the entrance. 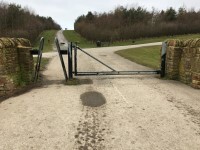 You are on Outside Access (Access Road Entrance). Skip to the next section. 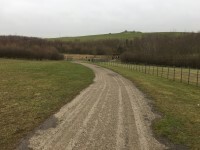 This information is for the entrance located leading from the main car park to the access road that leads into the park. 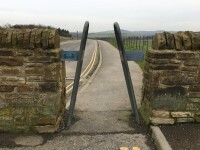 You are on Level Change (Access Road Entrance). Skip to the next section. There is/are 1 step(s) to the area/service. 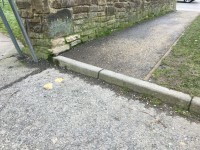 The step is created by the kerb from the car park path. 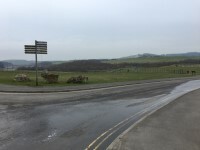 The step can be avoided by using the road. 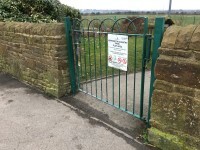 You are on Outside Access (Chester Road Entrance). Skip to the next section. This information is for the entrance located in Chester Road. 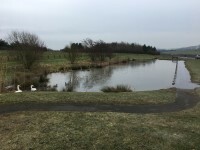 There are similar entrances leading into the park from the model boating lake (shown in photographs 3 and 4), McClaren Way (shown in photographs 5 and 6), Lady Beatrice Terrace (shown in photographs 7 and 8), Railway Terrace North (shown in photographs 9 and 10), and leading from the fishing lake area to the access road that leads to the skate park car park (shown in photographs 11 and 12). 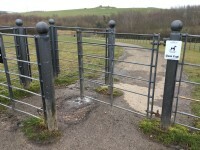 Some of the entrances have a gate next to them which prevents vehicles from entering the park, but allows pedestrians and horses to enter. 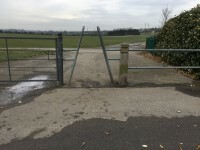 The barrier at the bottom of the anti-vehicle gate creates a deep step (30cm). 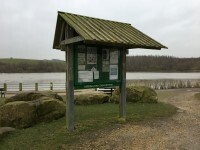 You are on Outside Access (Model Boating Lake Entrance). Skip to the next section. 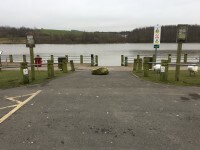 This information is for the entrance located in the model boating lake car park. 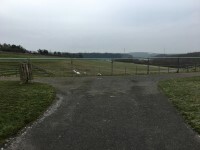 The width of the entrance is 320cm. 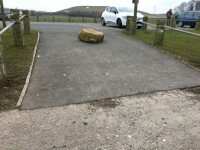 There is a boulder in the entrance area which reduces the width to a minimum of 121cm. 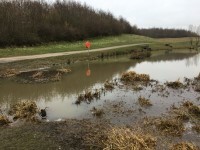 You are on Level Change (Model Boating Lake Entrance). Skip to the next section. 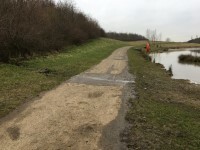 The ramp/slope is located on the path within the entrance area. 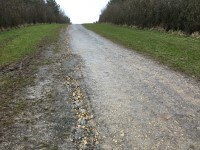 The path(s) has a / have compact earth, tarmac, gravel and muddy surface(s). 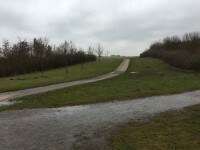 There are easy, moderate and steep slopes on the paths. 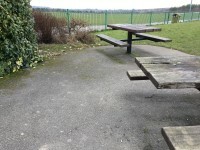 There are picnic benches opposite the model boating lake. 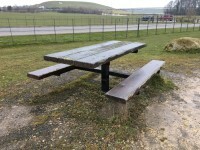 The height of the picnic tables is 67cm. 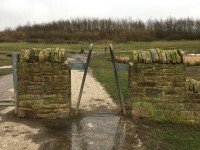 There are gates throughout the park to access various areas. 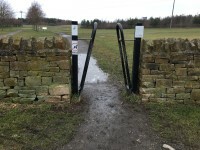 The minimum width at the gates is 123cm. 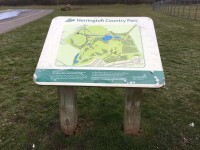 There are maps located at various points throughout the park. The height to the top of the maps is 110cm. 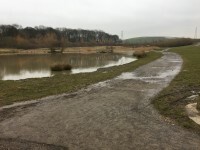 There are 3 walking routes marked on the maps. 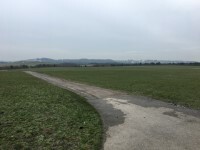 The lngth of the walking routes are 1km, 2km, and 3km. 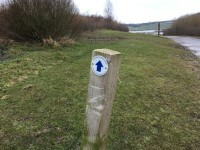 The routes are signposted throughout the park. 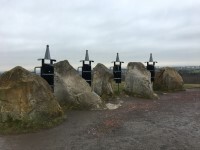 There are signposts located at various points throughout the park. 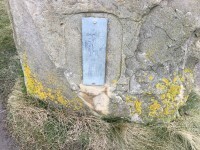 Some of the signposts are weathered and may be hard to read. 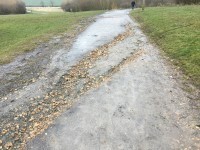 Some of the paths may become uneven during winter months and rain as the gravel may be washed down the gradients. 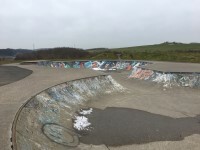 You are on Skate Park and BMX Track. Skip to the next section. 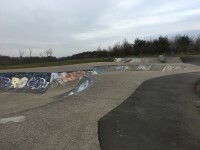 The skate park and BMX track are located to the west side of the park, opposite the skate park car park. 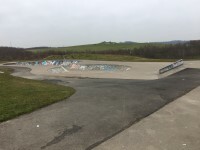 The surface of the skate park is tarmac and concrete. 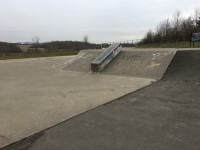 The skate park has some steep ramps / slopes. 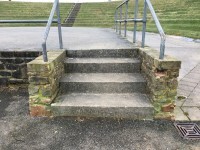 There are steps to access some areas of the skate park. 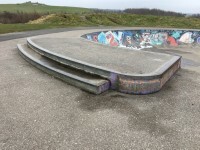 There are 2 medium height steps without handrails to access the top of one skate ramp. 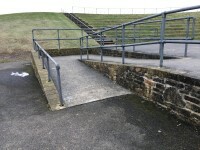 There are 7 medium height steps with a handrail to the centre to access the skate ramp nearest to the car park. 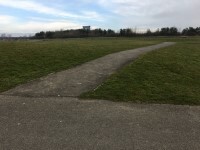 The BMX track is a grass and dirt track area next to the skate park. 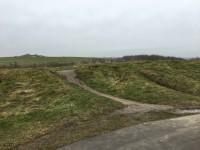 The BMX track has slopes with a variety of gradients throughout from easy to steep. 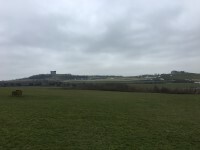 You are on Amphitheatre. Skip to the next section. 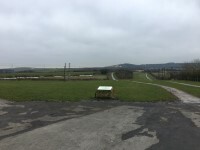 The amphitheatre is located at the fork in the access road leading to the two car parks. 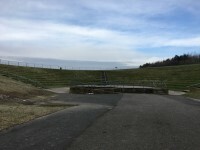 The amphitheatre is used for various outdoor events. 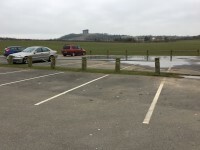 The nearest car park is the skate park car park. 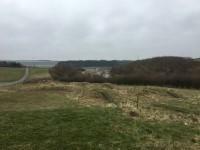 The entrance to the amphitheatre is a single gate, which opens away from you. 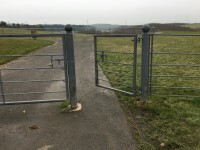 The width of the gate is 114cm. 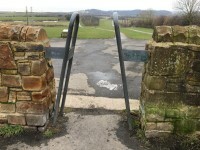 The gate gives access to the top of the amphitheatre. 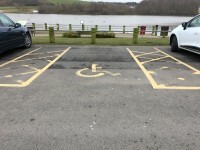 There is no designated seating for wheelchair users. 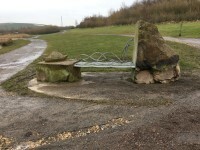 There is stepped access to the seating. The steps have handrails on the stage side. 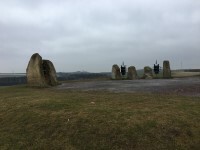 The stage is located at the front of the amphitheatre. The stage is accessed by an easy ramp. 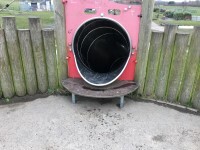 The ramp is 120cm wide. There are handrails on both sides. There are 4 medium height steps to access the stage. 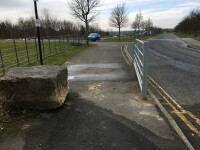 The steps do not have tactile paving. The steps have handrails on both sides. 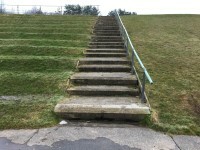 The ramp overcomes the steps. 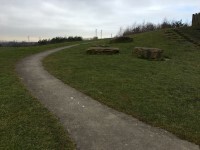 The lower area of the amphitheatre can be accessed by using one of the sloped paths leading down from the skate park car park. You are on Sight Lines Scuplture. Skip to the next section. 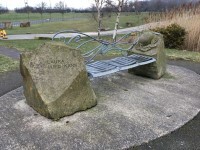 The Sight Lines Sculpture is located on a hill in the centre of the country park. 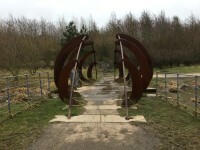 The sculpture is signposted throughout the park. 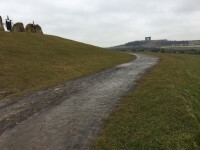 Access to the sculpture is via compacted earth and gravel paths. 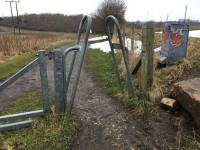 The paths are on an easy gradient and are over 150cm wide. 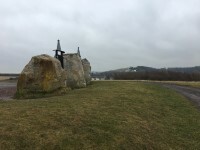 The sculpture features 7 viewing points with windows creating sight lines to local landmarks. 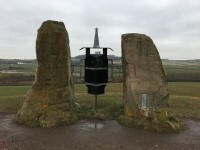 Each viewing point has a plaque with the name of the local landmark. 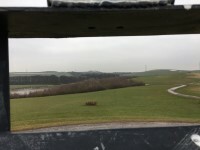 The height to the top of the viewing window is 170cm. 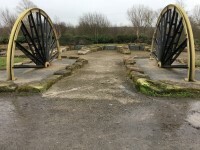 You are on Miners Memorial Garden. Skip to the next section. 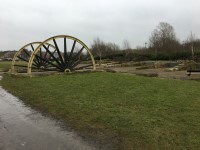 The Miners Memorial Garden is located to the south of the park, near the Railway Terrace North entrance. 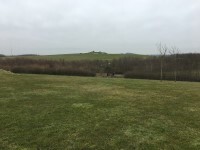 The minimum width at the entrance to the garden is 236cm wide. 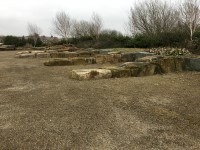 The surface of the garden is gravel and grass. 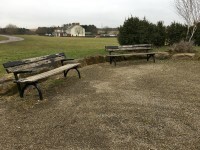 Ther are bench seats in the garden. 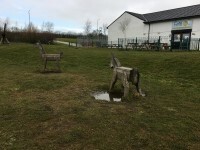 You are on Children's Play Area. Skip to the next section. 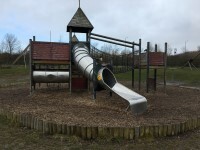 The children's play area is located at the north of the park, next to the car park, cafe, and toilet block. 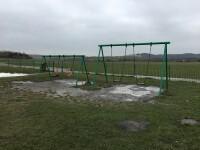 There is a gate to enter the play area. 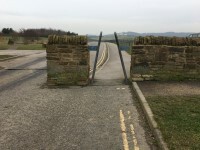 The gate opens away from you and is heavy. 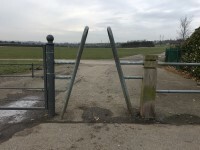 The width of the gate is 126cm. 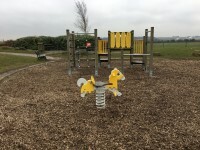 There is a variety of play equipment for different age groups. 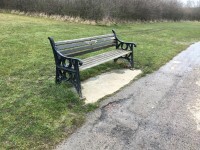 There are picnic benches near the entrance. 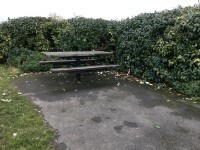 The height of the picnic benches is 77cm. 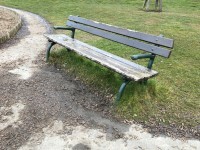 There are benches with armrests. 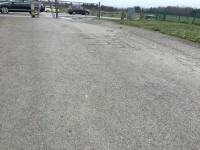 The surface of the paths is tarmac. 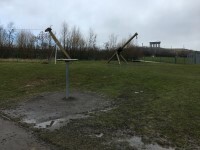 The surface around the play equipment is bark. 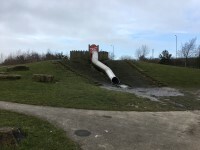 Some of the play equipment is accessed by slopes or steps. 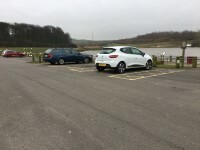 Please see the Herrington Country Park Car Park and Toilet Block guide for toilet details. 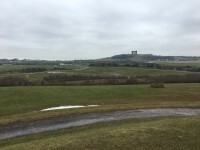 Herrington Country Park Car Park and Toilet Block link (new tab) - click here. Cafe on the Park link (new tab) - click here.